The Attitude Era, according to official WWE media, spanned a time period somewhere between 1996 and 2002, although the exact starting and ending points are essentially undefined. The organization has, over the years, given various dates, which differ drastically from one medium to the next. 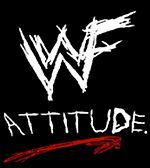 The 1996 King of the Ring on June 23, 1996, Survivor Series 1997 on November 9, 1997 (the first official usage of the "Attitude" logo occured during a vignette at this event.) and WrestleMania XIV on March 29, 1998, have been cited as the starting point of the era. The company officially ceased it's "Attiude" promotion on May 6, 2002. On that date, usage of intials "WWF", which were prominet within the logo, became prohibited as the result of a legal battle between the company and the World Wildlife Fund over the rights to legally use those intials. World Wrestling Federation Entertainment, Inc. officially became World Wrestling Entertainment, Inc. (WWE) and replaced its "Attitude" promotion with a new "Get the F out" marketing campaign. The Attitude Era proved to be a huge marketing success for the WWF, drawing in a previously unaccounted for young adult demographic that allowed them to successfully cripple competitor WCW by defeating them in the ratings wars. Within two years, WCW had become so unsuccessful that it lost its primetime television deal. During the same period, the WWF had become so financially powerful, that McMahon was able to buy the company from AOL Time Warner at a dramatically reduced valuation. During the Monday Night Wars, a ratings battle between the WWF's Monday Night RAW and WCW's Monday Night Nitro, the WWF transform itself from a family friendly product into a more adult oriented product. This era was spearheaded by McMahon and head writer Vince Russo, who drastically changed the way professional wrestling television was written. Russo's booking style was often referred to as Crash TV- short matches, backstage vignettes, and shocking television. Several miscellaneous events, outside the major benchmarks, have been credited with helping the transition the Attitude Era. In his book, Russo mentions the debut of the character Goldust in 1995 as a turning point in portraying a more adult character. Brian Pillman's "loose cannon" persona has also been credited, highlighted when he pulled a gun on Stone Cold Steve Austin and a 1997 storyline that contained sexual overtones with Marlena. By 1996, the WWF had also began playing female sexuality, led by Sunny and Sable. After losing a match that cost him a chance at the WWF Championship in March 1997, Bret Hart shoved Vince McMahon and went into profanity-laced tirade.